I’ll be the first to admit I’m not exactly a Westside girl (I blame overload of undergraduate memories in Westwood) but if it’s a sure thing, it’s well worth it for me to make the drive in that direction. You can call it a sure thing because while not new, Tavern is Suzanne Goin and Caroline Styne’s (Lucques, AOC) latest venture and I just had to see for myself. Well – in the company of some other foodie bloggers, that is, including Caroline on Crack, Diana Takes a Bite, Maya of ShopEatSleep, Lindsay and Sam of LAist. Brunch is that evasive meal on the weekend, always at the mercy of our discipline or irresponsibility the night before. We managed a no-earlier-than-noon reservation. Brunch, lunch … who are we to say what we can eat, when? Options are good – at least, this option proved a better alternative to Hamburger Hamlet, who had occupied the San Vicente space before. Of course, we started with cocktails. 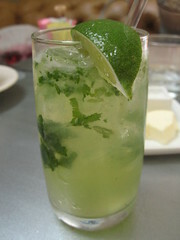 Caroline and Lindsay ordered the Ginger Rogers – made with Plymouth gin, mint, ginger syrup and soda. It was such a refreshing drink (sharing is caring) – and not too sweet. I hoped mine was just as good. My wish came true. 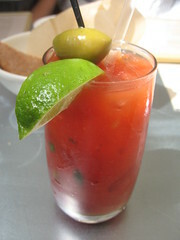 Since I’ve been on a Bloody Mary kick, I ordered the closest thing; Tavern’s version was royalty, called the Queen Mary. Tavern’s twist on it was Beefeater gin (instead of vodka), cucumber & tomato juice. I was very conflicted because up until then, by far the best Bloody Mary I’ve had was made by Matt Biancaniello over at Library Bar inside the Roosevelt. But the gin pleasantly surprised me, and I think the fresh cucumber and fresh tomato juice played no small part. Since the juices were fresh and no mixes were used, they mixed well with the botanicals in Beefeater gin. On to the food! 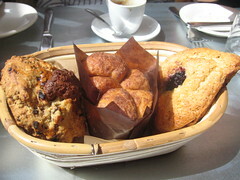 Sam took initiative and ordered a 3-pastry basket for us to share including monkey bread and a cornmeal scone. The cherry preserves inside the scone were absolutely fresh. But my favorite was definitely the monkey bread, which broke apart so easily and was of a soft, buttery texture with a touch of cinnamon. My favorite plate at the table was ordered by Caroline (above) – a Wild mushroom egg frittata with cheddar. It was such a savory dish and the mushrooms tasted extra fresh and even a little sweet. 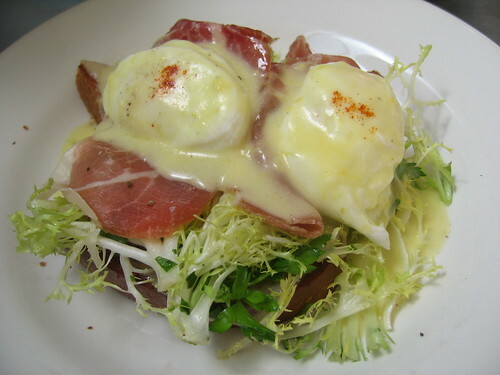 Atop a sweet, soft toast was a frisÃ©e salad, prosciutto and poached eggs perfect for the running once I put my fork through it. The hollandaise sauce in question actually shifted my perspective, a little. There was a surprising amount left in lemon reduction, making the dish a California hit. Gone were my expectations of a buttery, heavy hollandaise because this Benedict was actually delightful. The frisÃ©e complimented the prosciutto and sauce well. Perhaps it could have actually used more sauce. Perhaps I am just greedy. Of course, the point of having a just-big-enough-yet-not-too-big sized group reservation is so we can try what everyone else ordered – that is, lest anyone dare duplicate anyone else at the table! But from the little bites I had, I could not tell a particularly weak dish from the bunch. The Brisket hash with fried eggs and horseradish cream had good texture, with the herbed hash complimented well by the subtle horseradish in a fluffy cream. The lemon-ricotta pancakes were topped with huckleberries. While such a common breakfast/brunch dish all over town, I’m convinced I’d not tasted as much lemon infused into flapjacks as these. They were so good! Diana ordered a chopped salad including chopped chicken bacon, romaine, apple and Point Reyes blue. Though I thought chicken bacon was at least something to try, unfortunately Diana didn’t think the salad was particularly remarkable. I made a mental note to go for the heartier dishes and perhaps not the salads. 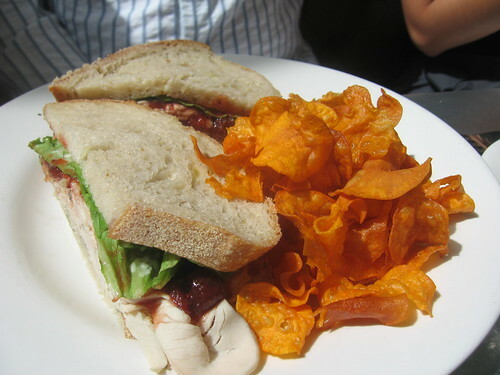 Sam went for the Pilgrim sandwich – with roasted turkey, cranberry and stuffing and a side of housemade chips that were perfectly, freshly fried and crisp to a subtly barbecue taste. The turkey was fresh as was the cranberry – just a really solid lunch sandwich. 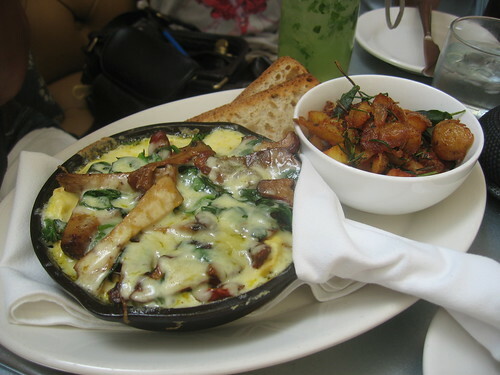 This entry was posted in Brentwood, Food and tagged Brentwood, brunch, San Vicente Blvd, Suzanne Goin, Tavern. Bookmark the permalink.